Herbs, perennial, usually cespitose, 30--80(--100) cm, base deeply set. Stems compact. 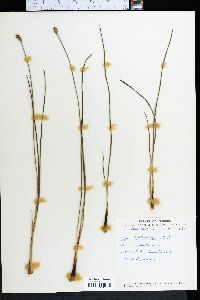 Leaves erect or ascending, 20--50 cm; sheath base chestnut brown; blade green, narrowly linear, twisted, 2--5 mm wide, compressed but fleshy, margins minutely tuberculate. Inflorescences: scape sheaths much exceeded by leaves; scapes linear, wiry, flexuous, nearly terete, 1.2--1.5 mm wide, distally 1-ribbed, rib smooth or somewhat scabrous; spikes ellipsoid to lanceoloid or cylindric, 10--30 mm, apex acute; fertile bracts 5--10(--13) mm, margins entire or erose, apex rounded. Flowers: lateral sepals conspicuously exserted, tan to reddish brown, nearly straight, 13--15 mm (including long hairs), keel firm, apex long-fimbriate, fimbriae red; petals unfolding in afternoon, blade obovate, 8--10 mm; staminodes bearded. Seeds translucent, cylindro-fusiform, 0.8--1 mm, with flat, longitudinal ribs. 2n = 18. Flowering summer--fall. Moist sands of pine savannas, bog edges, upper shores, flatwoods, sandy coastal dune swales, coastal plain; 0--300 m; Ala., Fla., Ga., La., Miss., N.J., N.C., S.C., Tex., Va.; West Indies (Cuba). In Florida and the lower Gulf Coastal Plain west to Mississippi are paler-leaved, white-petaled examples that have been treated as Xyris flexuosa var. pallescens (C. Mohr) Barnhart. These indeed are always in uniform populations but differ in no other significant way from the species. Since from typical plants. Because some other Xyris have white-flowered morphs (particularly X. platylepis), these are regarded as too close to be distinguished as varieties. Populational studies are in order, however. Lvs deeply set, the outer ones short, scale-like, castaneous, the principal ones linear, 20-50 cm נ2-5 mm, twisted and flexuous, the abruptly dilated, fleshy-thickened, dark brown, shiny bases long-persistent as scales; scapes 5-11 dm, twisted, flexuous, smooth to the touch, terete and minutely ridged below, somewhat flattened (and often 1-edged) above; spikes 1.5-3 cm at maturity, few- to many-fld, narrowly ellipsoid or lance-ovoid; lateral sep almost linear, nearly straight, the broad keel ciliate below, long- fimbriate (and often crisped) at the prominently exserted tip; pet-blades yellow or white, obovate, 8-9 mm, usually opening in afternoon; seeds 0.7-1 mm, narrow, with ca 20 strip-like longitudinal lines; 2n=18. Moist to well drained, sandy soil on the coastal plain, from N.J. and Va. to Fla. and Tex. Early summer-fall.